I’m sure you have all heard of the disavow tool, if not you may want to read through this guide to get to grips with it. Even if you have heard of it then this guide will help you make sure you are using the tool correctly. This guide is aimed to help anyone attempting to clean up the odd few unnatural links or to help you sort out your backlink profile should you become a target of negative SEO. So, what is the disavow tool? This tool was introduced way back in October of 2012, though not as many people use this tool as you may think, some that do use it, use it incorrectly still. The disavow tool is Google’s way of allowing you to ask Google not to view certain links that point to your site. Essentially you are creating an ‘invisible nofollow’ tag for the link you choose to disavow. A key point to make is that you should only use the disavow tool on links that you know (or believe) have been made with the intention of manipulating Google’s search results. – We use two sites to help us with our data collection – Majestic & ahrefs. The reason we use both of these sites and not just one of them is to make sure we have a comprehensive list with as much data as possible. – Paste your URL into both websites and hit the search button. 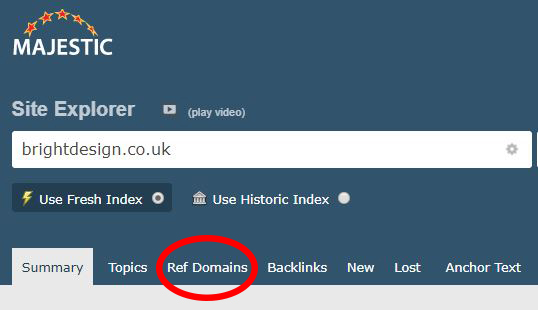 – Once you have the information for your selected site loaded up, select the ‘Referring Domains’ link on each site. This will load up a list of all the referring domains that are linking to your site. – Export these lists into an excel sheet. This is the basis for your data, what we need to do now is make sure we have no duplicate domains. To do this we need to copy the column with all the domain names from both the spreadsheets and paste them into a new sheet. – Once you have this new sheet use the ‘Remove duplicates’ function in excel. – What you have now is a complete list of domains that link to your site. We will now use Majestic once more to turn this plain list into a document with some more useful information included. 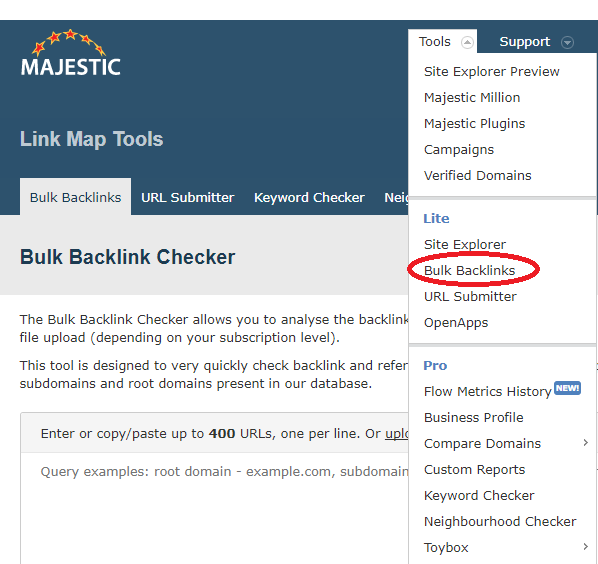 We will copy & paste this list into Majestic’s ‘Bulk backlink checker’ tool. – This will give you a full list complete with the referring domains Citation Flow and Trust Flow. You can get rid of the columns that don’t provide you with any use for this task, I would suggest keeping at least the Citation & Trust flow. – Now comes the long, manual part of this. 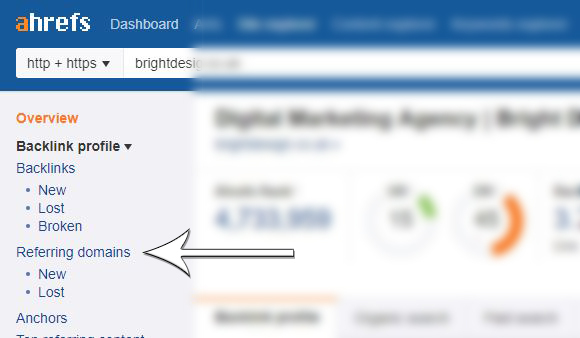 You will have to go through all the domains manually to check if you want them linking to your site or not. You can use the data you decided to keep (citation & trust flow) to help you determine where to start looking. Once you have decided whether or not you want to keep or disavow these domains, make a list of the domains you wish to disavow in a new Excel spreadsheet. – Now to make sure we disavow the domains and not just the URL’s we need to use a small formula on Excel. You can do this quickly and easily in Excel using CONCATENATE. 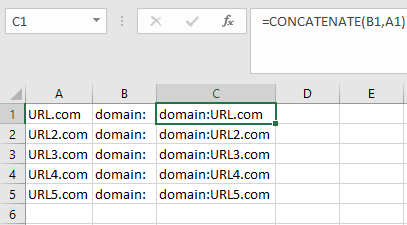 If your domains are listed in column A, then just add ‘domain:’ alongside in cell B1, and fill down. Then, in cell C1, simply add the formula: =CONCATENATE(B1,A1), and fill down. You then need to save the data in a notepad file as the document you upload has to be a .txt file. – Finally, paste this link – https://www.google.com/webmasters/tools/disavow-links into your browser and choose your site. 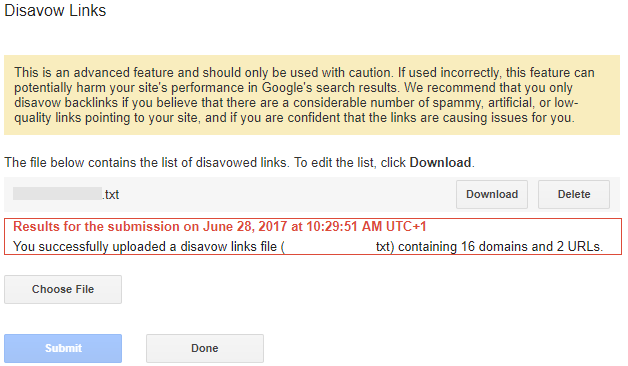 If your site has never had a disavow before you can just upload your file to the system. If however your site already has a disavow file, (now this is really important!) you will need to download the file already in the system and then MERGE your list with the original. This is due to the fact that your file would overwrite the original so all the previously disavowed domains would become void. So now we have gone through the process of how to create, audit and upload your disavow list, we want to make sure you know some helpful tips to help you along the way. These will not just help you now but they will prove to be valuable tips to help in the future. – When you upload a disavow file you are COMPLETELY OVERWRITING the old file. Make sure you take this into account as stated If your old file has 100 domains and you are adding 20 then your new file should have 120 domains disavowed. #For example, you may want to include the date of when you made this list and why you created it. – Your disavowed links will still be visible in Webmaster Tools & other web crawling systems. So don’t worry that it is not working, it is but the links are not deleted, they are just made ‘invisible’ so they do not carry any juice into your PageRank. – You do not need to include any nofollow links as these do not carry any PageRank in the first place. – You are able to Reavow your links should you wish. If you change your mind about certain links or added a domain in error then you can remove them from your list and just reupload the list. So now you have all the information you need to create and upload a disavow list, why not go have a look at some of your sites to see if you could potentially help your sites rankings by using the disavow tool.